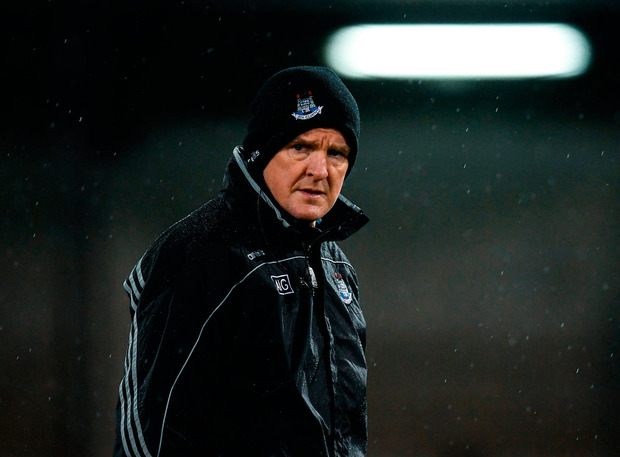 A significantly improved second-half performance in Parnell Park helped Dublin to beat Carlow by six points, thus sparing Kenny the sort of opening night his predecessor Pat Gilroy suffered at the hands of Offaly in Croke Park last year. Under incessant January rain that subsided somewhat around half-time, the pitch in Parnell Park cut up badly and the ability to simply maintain balance was priceless. An early second-half spurt and a pronounced, game-winning impact from their bench gave Dublin two Division 1B points. Early on, John Hetherton dominated the skies on his full league debut and he was central to the first significant score of the game when he fed Eamonn Dillon, off whose hurley the sliotar bounced to the onrushing Darragh O'Connell. In his first inter-county action since April 2017, the Cuala midfielder slammed a goal past Brian Tracey. Thereafter, Carlow were the better team until half-time. Easily the most powerful performance of the half was that of Carlow centre-forward, Marty Kavanagh. On a sloppy, sodden night for freetaking, Kavanagh struck his impeccably and added a couple of excellent points from play to the mix. He finished with 0-12 (9f). And Carlow led by two at half-time, impressively scoring 0-11 from 11 scoring chances. At half-time, Donal Burke was added to the mix and the Na Fianna forward finished with 1-4, all from play. With Kavanagh better wrapped by Eoghan O'Donnell after moving to the edge of the Dublin square, Carlow found scores hard to come by. By contrast, Burke and Danny Sutcliffe gave Dublin the impetus to secure victory. Scorers - Dublin: D Burke 1-4, E Dillon 1-1, J Hetherton 0-4 (3f), D O'Connell 1-0, F McGibb 0-2, F Whitely, T Connolly, P Smyth, O O'Rorke (f) 0-1 each. Carlow: M Kavanagh 0-12 (9f), T Joyce, C Nolan 0-2 each, S Murphy, J Doyle 0-1 each. Kerry's hurling league campaign got off to a winning start yesterday. The Kingdom hit the ground running and by the fourth minute they were 1-1 to no score to the good, the in-form Jordan Conway with the opening point and Jack Goulding firing past Ryan Elliott seconds later. Antrim got off the mark through James McNaughton but the Kerry defence was largely on top in the opening quarter and Pádraig Boyle, Conway and Goulding added six unanswered points between them for a 1-7 to 0-1 lead. Antrim matters weren't helped with the sending off of Nicky McKeague on nine minutes, but the Saffrons dragged themselves back into it when Eoin O'Neill fired to the net. Two McNaughton frees and a second goal for O'Neill had Antrim within a point but Kerry were settled with scores from Conway and Boyle. Antrim were reduced to 13 when Keelan Molloy clashed with Jason Diggins. Scorers - Antrim: J McNaughton 0-12 (9f, 1 65), E O'Neill 2-0, J O'Connell 0-2, K Molloy & C McHugh 0-1 each. Kerry: S Conway 0-12 (9f, 1 s/l), J Conway 0-5, J Goulding 1-1, P Boyle 0-3. Antrim: R Elliott; S Rooney, J Dillon, P Duffin;R Molloy, S Duffin, M Donnelly; C McCann, C McHugh; N Elliott, J McNaughton, N McKeague; E O'Neill, K Molloy, C Clarke. Subs: J O'Connell for R Molloy (h-t), C Boyd for E O'Neill (56), J McGoldrick for C Clarke (62), C Patterson for P Duffin (69), C Laverty for N Elliott (69). Kerry: M Stackpoole; S Weir, B Murphy, E Leen; J Diggins, M Boyle, F MacKessy; B Barrett, D Griffin; M O'Leary, S Conway, M Leane; J Conway, P Boyle, J Goulding. Subs: D Goggin for J Goulding (51), T O'Connor for B Barrett (54), M Slattery for M Leane (59), J O'Connor for D Griffin (68), P Costello for J Diggins (70).